Anyway, Mr. Levine, if you can take a few minutes from making BioShock Infinite, I've got some recommendations for you for this week. I'm only personalizing this for you today. Next week, you'll have to fend for yourself like the rest of the readers. Today, I'm speaking directly to you. 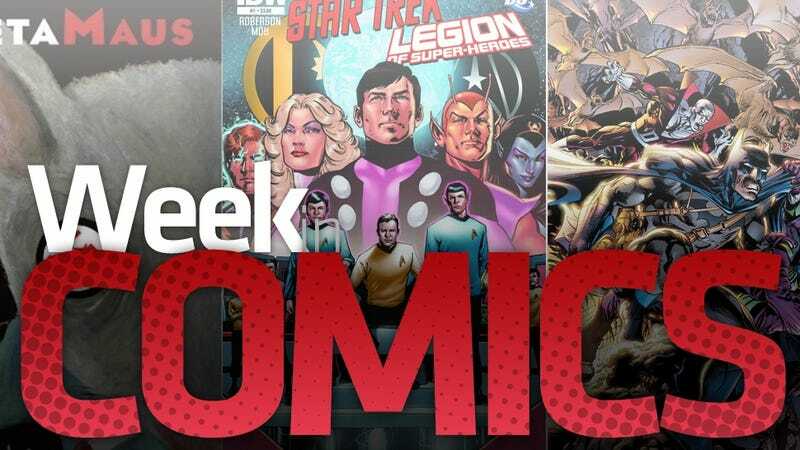 Oh, and it happens to be a great week for new comics. I hope you got paid this week. There's a lot to buy and read. Avengers 1959 #2 The Avengers, in the 50's, written and drawn by Howard Chaykin. This is good. Batman #2. Memorize the name Scott Snyder, Ken. He's a rising star in comics writing, and his Batman stories over the last year or so have been fabulous. Gritty without feeling exploitative. Energetic without being campy. Menacing and captivating. The second issue of his barely-rebooted Batman run is out today. Batman Odyssey 2 #1 Some people will tell you that legendary 1970's comics artist Neal Adams lost his mind during or before writing the first Batman Odyssey series that started about a year ago. They don't like insane Batman comics, I guess. And by "insane" I mean comics in which it seems like Batman is yelling at you, the reader, when he's not surviving a point blank gunshot to the head, arguing with Deadman, stopping the heist of futuristic car, being a jerk to everyone and just talking and talking and talking while beating the tar out of everyone. People who take Batman seriously would hate this comic. Please, don't take Batman too seriously. Best American Comics 2011 Fun Home creator Alison Bechdel edits this year's volume, which includes work from Joe Sacco, Jeff Smith, Dash Shaw and more. Deadpool MAX 2 #1 The first 12-issue series was insane, though not as insane as Batman Odyssey. And Kyle Baker is one of country's best comics artists. This may not be a helpful description. Let's see if the official summary is more useful: "Because YOU demanded it Deadpool MAX returns for another round of anarchy, insanity and involuntary Armageddon. After rooting out a shadowy government conspiracy Deadpool and Bob set out to stop it…and totally futz it up. Now they stand accused of killing a quarter of a million people. Everyone hates them and wants them dead. They are now the worlds most wanted terrorists. How do you stay alive, stay sane and clear your name when you've got the entire world hunting you down and saying horrible things about you on TV?" Actually, that doesn't help, does it? It's black comedy. That help? What if I told you the Deadpool is a lunatic and that his handler, Bob, pretty much lies to Deadpool about everything to get Deadpool to kill people. Fear Itself #7 I bailed on Marvel's big 2011 cross-over a while ago, but if you care, the final issue is out. Ganges #4 When I'm not telling people how much I love Grant Morrison's work, I'm confessing that Kevin Huizenga is actually my favorite comic book creator working right now. His work is tough to describe. Sometimes he writes and draws comics about riding his bike around town. Sometimes he imagines surreal Street Fighter contests. This time, well, let's let the official summary explain: " Can you make an exciting comic out of insomnia? Kevin Huizenga rises to the challenge as he depicts his alter ego Glenn Ganges wrestling with sleeplessness, trying to trick it by reading a particularly abstruse book, obsessively breaking his past, present and future life into ever more hallucinatory, complex grids, and wandering around his darkened house trying not to wake up his wife. Also: Loose cat action!" Great Northern Brotherhood of Canadian Cartoonists Does the name Seth mean anything to you? Palooka-ville? Seth's one of the giants of indie comics, since the 90's at least. He's got a new book out this week, $25 and all I know about it is that it 's a new story from Seth. Oh, and I love the cover. John Byrne's Cold War #1 Were you a Byrne guy? Superman: Man of Steel made me fall in love with comics. I hear his Fantastic Four was great, and I know lots of kids drooled over the Claremont/Byrne X-Men. Byrne is legendary. Over the years, though, he's lost a step or two. I still try his new stuff, but his art had gotten so loose and his writing got, well... let's just say I started noticing lots of scenes of older guys smooching younger women. Anyway, he's got a new book out. Official summary: "Acclaimed creator John Byrne releases his latest creation, MI-6 agent Michael Swann. In Swann's opening 4-part adventure, 'The Damoclese Contract,' the secret agent is called on to stop a defecting British scientist from granting the Soviets complete nuclear dominion over the free world…"
Justice League #2 Did you like Jim Lee's art on X-Men back in the day? I never was a big Jim Lee fan. I appreciate what he does but I don't understand why people lose their minds over it. I prefer quirk, like MIke Mignola or Keith Giffen or cleaner, well-drafted art like Cliff Chiang or Jaime Hernandez. But, hey, Lee's second issue of Justice League, written by crowd-please Geoff Johns should be cool. It's a Batman vs. Superman issue. That's always fun. Metamaus Somewhere up above I said this was a strong week. Are you getting that sense yet? This might be the biggest comics week of the year. I mean, we're getting Art Spiegelman's new follow-up to Maus. Unbelievable. Official summary: "The cartoonist re-enters the book that consumed him for over a decade to talk about his survivor parents, the oxymoron of picturing life in a death camp, his guilt-ridden success, racist imagery, and his beloved medium. Witty, intimate, and revelatory, MetaMaus tells the story of how and why a work of art is made, as it grapples with the questions that Maus has most often evoked: Why the Holocaust? Why mice? Why comics? In this book and its accompanying DVD, Art Spiegelman provides an onscreen reference copy of The Complete Maus linked to a large archive of audio interviews with his father, memories of his mother by those who knew her during the war, essays about cartooning, scholarly essays about Maus, thousands of preparatory sketches and drafts, scans of his private Maus notebooks, and much more." S.H.I.E.L.D. (trade paperback collection) Writer Jonathan Hickman is doing fine work these days, but I've been waiting over a year for Marvel to collect his acclaimed S.H.I.E.L.D. series. Hickman imagines a generations-spanning secret society that involves the likes of Da Vinci, Gallileo and Newton. It's like Assassin's Creed, Nick Fury-style. Or at least, that's what I heard. Why Marvel took so long to put out a softcover collection is beyond me, but it's finally out. Star Trek/ Legion of Super-Heroes #1 Let me make this clear. It's the Kirk/Spock Enterprise crew meeting DC's Legion of Super-Heroes. How did this never happen before in any official non slash-fiction capacity? Supergirl #2 Maybe it's punch-Superman week? The surprisingly good first issue gets a follow-up that is all about Supergirl fighting Superman. Superman: Secret Identity #1 This collects the first two issues of the Kurt Busiek-written mini-series. It was good but I wasn't going to recommend it. Then our mutual friend Evan Narcisse, Kotaku's newest comics expert, chimed in. We have to recommend this, he said. Tell Ken, I said. Here's Evan: "Superman: Secret Identity's one of the best stories ever featuring DC's iconic character. It's about a kid named Clark Kent, who—after years of being teased about his name-finds out he actually does have Kal-El's powers and abilities in a world with no other superheroes. You'd probably like Busiek's naturalistic approach to character, which homes in on to the loneliness and responsibilities that Clark Kent has deal with. Wolverine #17 Marvel's best writer, Jason Aaron, has been telling great Wolverine stories lately. He and artist Ron Garney start a new storyline this issue. Official summary: "It's a new day for Wolverine, but first he has one last bit of old business to deal with... in Chinatown. That is, unless Gorilla Man gets there first." Wonder Woman #2 If you're going to trust me about anything, trust me about this. I don't need to explain, because you are trusting me right now. Mass Effect: Invasion #1 I can't vouch for video game comics most of the time, because I don't read them. I mean, I hope they'd be good, but you know how it is, right? People want to adapt your stuff to movies, TV or whatever and are they any good at it? Do they even follow through? The Mass Effect comics do tend to be pretty good, and, look, they have the game writer co-writing. That's good! Official summary: "An essential new story from the Mass Effect 3 universe! The Omega space station is the center of lawlessness in the galaxy, a den of vice ruled by the deadly asari Aria. It is also a strategic foothold in a galaxy-wide power struggle, and when the station comes under attack from a new threat unleashed by the humanity-first organization Cerberus, Aria is forced to become more ruthless than ever to protect her home-and her dominion!" DC Universe Online Legends #16 Official summary: "Hal Jordan and the other human Green Lanterns have been recalled to Oa under emergency circumstances. Brainiac's main fleet has been located and he's gone to war with the Sinestro's Yellow Lantern Corps on Korugar! The mission: Containment, allowing both enemies to annihilate each other!" Ducktales: Rightful Owners (trade paperback collection) This is not a video game comic. Except, it's written by Warren Spector. Halo: Fall of Reach: Covenant #4 Official summary: "The Covenant have invaded a human colony — but what are they searching for? Master Chief and his Spartans must discover the truth behind the Covenant's actions before the planet and everyone on it is turned to glass!" Rage: After the Impact Did you like Rage? I didn't even finish it yet, so how could I justify reading the comic? Official summary: "The earth has been devastated by an asteroid, with a tiny fraction of the population surviving under the rule of a military dictatorship. But when a scientist studying those mutated by the disaster discovers that the story the new leaders are telling isn't true, she has no choice but to fight back." And the best comic I read last week…. Oh, what does it matter? I've recommended enough comics. Plus, I was busy running around New York Comic-Con and playing video games I can't admit to playing yet.